Korea has indicated that it will, very gradually, start to disclose a bit more about its direct activities in the foreign exchange market. The Korean announcement presumably was meant to front-run its currency side agreement with the United States. Optics and all—better to raise your standard of disclosure unilaterally and then lock in your new standard in a trade deal than the reverse. The problem is…Korea’s actual disclosure commitment is underwhelming. If this is all the U.S. is getting out of the side agreement, it is a bad deal. It sets too low a bar globally, and fails to materially increase the amount of information available to assess Korea’s actions in the market. Many emerging markets disclose their purchases and sales (separately) monthly, with a month lag. India for example (see the RBI monthly data here [table 4] and here). That should be the basic standard for any country that wants a top tier trade agreement with the U.S. Remember, the agreement is about disclosure only—it isn’t a binding commitment not intervene. What has Korea agreed to? A lot less. Korea will start to disclose quarterly with a quarter lag at the end of 2019. But that’s still a long lag. Intervention in January 2020 wouldn’t be disclosed until the end of June 2020. Moreover, quarterly disclosure of net purchases doesn’t provide much information beyond what is already disclosed in the balance of payments (BoP). The BoP shows quarterly reserve growth, which combines intervention and interest income, with a quarter lag. Now is it true that quarterly intervention with a quarter lag was the standard in the TPP side agreement. But the Trump Administration has claimed that TPP was a bad deal, and they would do a better deal. They don’t seem to have gotten that out of Korea. And currency intervention should have been a real focus in the negotiations with Korea. There is no doubt Korea intervenes, at times heavily. And I am confident that the absence of any currency discipline in the original KORUS has had a real impact. Korea, in part through intervention, has kept the won weaker than it was prior to the global crisis. And the won’s weakness in turn helped raise Korea’s auto exports, and thus contributed to the increase in the bilateral deficit that followed KORUS. To be sure, Korea’s German style fiscal policy has also contributed to Korea’s overall surplus. But that isn’t something that realistically can be addressed in a trade deal. Moreover, the failure to get a higher standard than TPP undercuts the Trump administration’s argument for bilateral deals. A big, multi-country deal can in theory be held up by a few reluctant countries. Singapore, for example, has made no secret of its opposition to a high standard for the disclosure of foreign exchange intervention (see end note 4 in the currency chapter of the draft TPP agreement; I assume exceptions to quarterly disclosure didn’t arise by accident). Singapore also discloses comparatively little about the activities of the GIC. And a bilateral deal in theory also could address country-specific currency issues—like the activities of Korea’s large government pension fund. A reminder: Korea’s government-run pension fund is building up massive assets, placing a growing share of those assets abroad and reducing its hedge ratio (it is now at zero, or close to it). This at times has looked a bit like stealth intervention. And it certainly has an impact on Korea’s external balance—structural, unhedged outflows of well over a percentage point of Korea’s GDP have helped Korea to maintain a sizeable current account surplus with less overt intervention. And I worry that the pension fund’s balance sheet will in the future provide Korea with an easy way to skirt the new disclosure standard—particularly if Korea would be at risk of disclosing a level of intervention that might raise concerns about manipulation. Suppose the Bank of Korea bought a bit too much foreign exchange in the first two months of a quarter. The Korean government could encourage the pension fund to buy a couple of billion more in foreign assets in the third month of the quarter, and meet that demand through the sale of foreign exchange from the intervention account. Voila, less disclosed intervention. Remember, sales don’t need to be disclosed separately. A bilateral deal in theory could have included commitments disclose the pension service’s foreign assets, and its net foreign currency position vis-à-vis the won (e.g. its hedges, if any). It thus could have set a standard not just for disclosure of direct intervention, but also for disclosure by sovereign wealth and pension funds. The side agreement on currency with Korea consequently looks to be to be a missed opportunity for sensible tightening of disclosure standards, on an issue that really matters for the trade balance. Now for some super technical points. The intervention data should not precisely match the reserves data. When Korea buys foreign exchange, it sometimes then swaps the foreign exchange with the domestic banks for won. This lowers the net amount of foreign exchange the central bank ends up directly holding, while creating a future obligation to buy back the dollars swapped for won. This shows up in the central bank’s reported forward book. Total intervention thus may exceed the change in reserves in the balance of payments. However, it can be inferred from the combined increase in reserves and forwards—and Korea currently releases both its forwards monthly and its balance of payments data monthly. As a result its intervention can be inferred from these monthly numbers—quarterly data with a quarter lag will add very little. 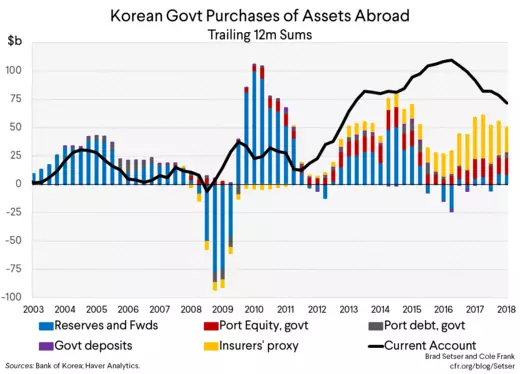 The buildup of government assets abroad—non-reserve government assets that is—now accounts for a significant share of the net outflow associated with Korea’s current account surplus. And with higher oil prices set to lower Korea’s surplus further, that share will grow. 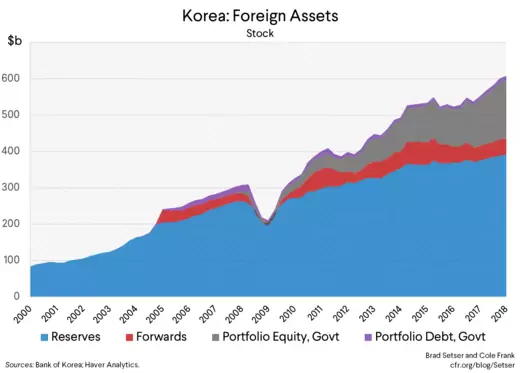 As a chart of the net international investment position shows, the rise in the foreign assets by the National Pension Service now accounts for the bulk of the rise in the total foreign assets of the government of Korea. On a flow basis, outflows from insurers are now more important than the pension outflow—however the insurers, unlike the NPS, supposedly hedge. 3. 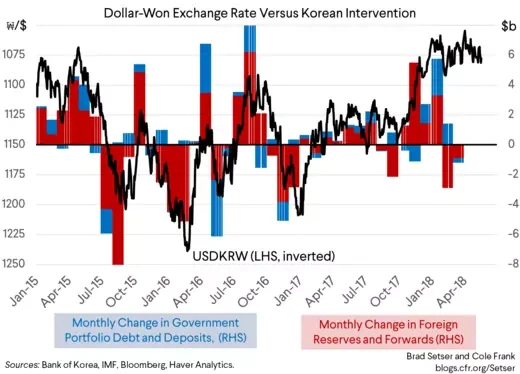 The increased scrutiny of Korea’s management of the won that has come with the negotiation of the currency chapter—and the risk Korea could be named in the foreign exchange report—has had some positive effects. It didn’t keep Korea from intervening pretty massively to block won appreciation in January at around the 1060 mark (and I suspect Korea has bought at a few other times in the first quarter as well). But it does seem to have encouraged the Koreans to take advantage of dollar rallies to sell won and thus hold their net purchases down. In 2015 and 2016 the Koreans didn’t tend to sell dollars unless the won was approaching 1200 (an extremely weak level). In the past few months they have been selling on occasion at around 1100 (or at least not rolling over some maturing swaps and thus delivering dollars to the market). The won’s trading band has been pretty tight. I just think the block at 1060 should disappear. */ as I understand it, Korea won’t ever disclose its intervention this January—the first disclosed data will be for the second half of 2018.